I know some of you nice people out there think that you’re doing good by buying only “cage-free” or “humane” or “free-range” eggs and meats. While I will agree that this is the lesser of the two evils that come with harvesting food from animals, I will also argue that these are just marketing claims and are still not ok. The truth about free range is different than what these advertisements claim. There’s a huge market out there for organic, free-range, cage-free, and humane animal products. People want to feel that they are making better, smarter choices by choosing these products. The truth, however, is that these products aren’t too much different from conventionally-raised meat. I’d like to begin with some excerpts from Michael Pollan, an author, journalist, and activist who I dearly love and admire. In his book The Omnivore’s Dilemma, he talks about “Big Organic” and what he found out it really means. “I enjoy shopping at Whole Foods nearly as much as I enjoy browsing a good bookstore, which, come to think of it, is probably no accident: Shopping at Whole foods is a literary experience, too. That’s not to take anything away from the food, which is generally of high quality, much of it “certified organic” or “humanely raised” or “free-range”. But right there, that’s the point: It’s the evocative prose as much as anything else that makes this food really special, elevating an egg or chicken breast or bag of arugula from the realm of ordinary protein and carbohydrates into a much headier experience, one with complex aesthetic, emotional, and even political dimensions. Take the “range-fed” sirloin steak I recently eyed in the meat case. According to the brochure on the counter, it was formerly part of a steer that spent its days “living in beautiful places” ranging from “plant-diverse, high-mountain meadows to thick aspen groves and miles of sagebrush-filled flats”. Now a steak like that has got to taste better than one from Safeway, where the only accompanying information comes in the form of a number: the price, I mean, which you can bet will be considerably less. But I’m evidently not the only shopper willing to pay more for a good story. With the growth of organics and mounting concerns about the wholesomeness of industrial food, storied food is showing up in supermarkets everywhere these days, but it is Whole Foods that consistently offers the most cutting-edge grocery lit. On a recent visit I filled my shopping cart with eggs “from cage-free vegetarian hens,” milk from cows that live “free from unnecessary fear and distress,” wild salmon caught by Native Americans in Yakutat, Alaska (population 833), and heirloom tomatoes from Capay Farm ($4.99 a pound), “one of the early pioneers of the organic movement.” The organic broiler I picked up even had a name: Rosie, who turned out to be a “sustainably farmed” “free-range” chicken from Petaluma Poultry, a company whose “farming methods strive to create harmonious relationships in nature, sustaining the health of all creatures and the natural world.” Okay, not the most mellifluous or even meaningful sentence, but at least their heart’s in the right place. 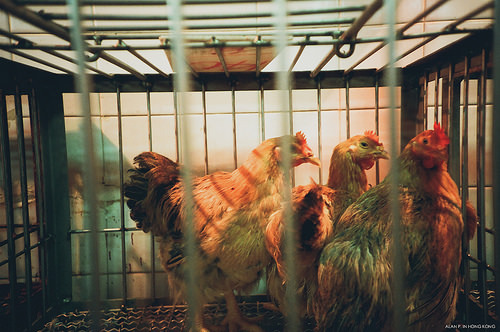 The Food and Drug Administration’s free-range policy for poultry is this: the facility must show that the chickens have been allowed access to the outside. This doesn’t mean that the animals are required to spend any time outdoors or even that they have gone outside at all during their lives. So while you might be purchasing chicken thinking that the chicken lived its life in a peaceful meadow, the reality is often far from this idea. Turns out, the FDA doesn’t have any solid guidelines for what a free-range chicken egg should be, so this label really is just a marketing term, similarly to how the claim “dairy-free” has literally no backing according to the FDA. But what about beef and pork? So for these types of meat, pasture-raised means that the animal has been provided access to the outside for a minimum of 120 days a year while grass-fed means that the animal was fed a diet consisting solely of forage its entire life after being weaned off its mothers milk, but not necessarily that the animal was ever outside, just that they were fed grass and not grain (which, from a consumer standpoint, is healthier, but not really humane). I advocate for LOCAL meat and eggs. This does not mean you trust a supermarket to tell you the truth about free range, where this animal has lived, what it ate, or what its lifestyle was. I do believe that buying organic (according to the USDA’s definition) is better even though I don’t necessarily believe it’s the most humane or sustainable way to enjoy meat and eggs. You need to look for small grocery stores (and I mean really small) if you truly want local or humane meat. Some of these meat and egg products might not even be humanely raised or handled, just local, so you’ll need to find out for yourself how the animals are treated. You need to go find these farms and actually see them for yourself. And if the people don’t let you see the farm even after you offer them money for their meat or eggs, you know there’s a problem and something disturbing is going on there and that they don’t want you to know the truth about free range. If you want to buy your eggs and meat from the supermarket, going to a place like Whole Foods and buying products that say “humane” or “free-range” might not be any better than going to Wal-Mart. I would advocate for you to buy locally or just kill and skin that animal yourself. You probably shouldn’t be eating meat then. If you’re not willing to go through with the actions that brought you your meal, what sense does it make to eat it? You can make a difference by choosing to purchase truly local foods that ensure animal welfare and healthier products. Oh, and “cage-free”? This term, according to the FDA, means that the chickens are usually packed so tightly into barns that they live in their own feces, get their eyes and feathers plucked on by other chickens, and are more prone to disease.